It was built in 1867 - 1868 on the corner of the Dušní and Vězeňská Streets in a Moorish style according to a project of Ignatz Ullmann and Josef Niklas in place of the oldest synagogue called Old School (Stará škola) or also Templ, which, according to the preserved reports, already existed in the 12th century. Synagogues originally served as schools for general education of both the youth and the adult members of the Jewish community. When Isabella of Castile expelled the Jews from Spain at the end of the 15th century, one of their groups found home in Prague. They were given this Old School as the house of prayers, and since then the building has also been called the Spanish Synagogue. When the old building failed to be sufficient in capacity, a new building was erected, very well equipped on a technical side for the time. There was central heating and special attention was paid to good acoustics, because choir music and singing was practised here on a very high level, to be documented by a fact that František Škroup, the author of music to our national anthem, was the choir leader here after 1836. The construction was managed by Quido Bělský. A new-Renaissance building with a square ground plan has a mighty dome above the central premises. Remarkable and spectacular interior decorations imitating Spanish interiors in Alhambra were designed by architects Antonín Baum and Bedřich Münzberger. In a spirit of religious traditions, the interior decorations are only ornamental; the surface is covered by low stucco arabesque of stylized geometrical and vegetative motives inspired by Islamic architecture with rich gold coating and polychromy, repeated also in the arts-and-crafts accessories. There are rich colourful stained-glass windows in the building. In 1935, architect Karel Pecánek added a modern object named Winter Synagogue. The synagogue ceased to be used for divine services in 1941. 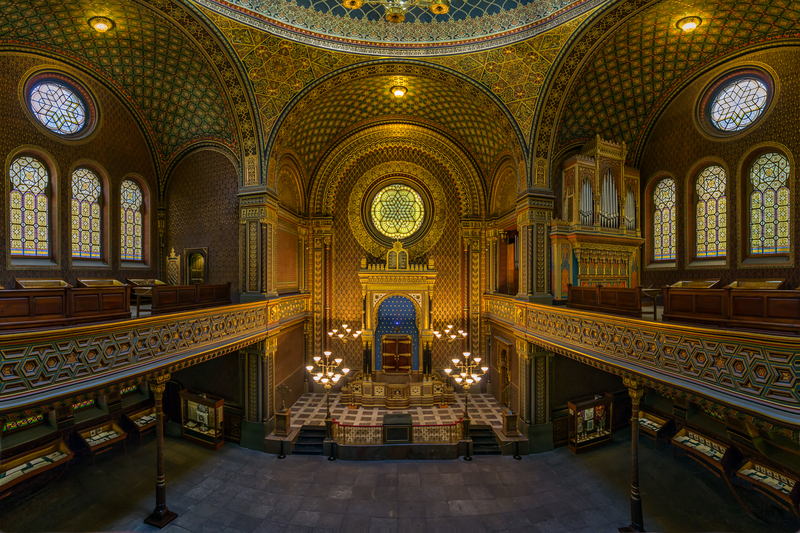 In 1955 it was transferred onto the Jewish Museum, in 1958 - 1959 the interiors were restored according to a project of architect Otto Rothmayer, and in 1960 an exposition of synagogue textiles was installed here. In 1979, the building had to be closed due to emergency condition. The reconstruction was carried out in 1995 - 98, after long periods of postponing, according to a project of architect Petr Běťák. The exterior skin was repaired, as well as technical mains, but the restoration namely concerned the interior: stucco and wall painting decorations, gold plating, stained-glass windows, organ, blacksmith, straining and joinery elements, stone and textiles. The permanent exposition of the Jewish Museum in the main aisle and on the synagogue’s gallery named History of the Jews from emancipation to present is a continuation of the exposition in Maisel Synagogue named History of the Jews in Bohemia and Moravia from the early settlements until the start of emancipation (10th century until the 18th century). Spanish Synagogue was opened for public on the 26th November 1998.